This mall was one of the first enclosed malls in Cincinnati. (Supposedly the 2nd, if you count Sycamore Commons.) Built in 1969 and renovated probably several times since then, it was a local mall, attracting shoppers mostly in the Anderson area. 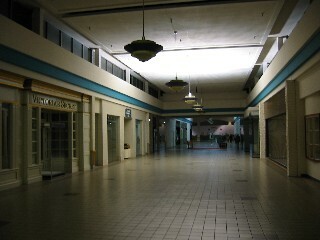 Although they claim that Eastgate Mall (over 10 miles away, not much larger, and not very convenient), Kenwood Towne Centre (almost 20 miles away, and not easy to get to) killed this mall, this Mall's death was due mostly to poor management, and absurdly high lease rates, moreso than direct competition or a shifting economic base. The Anderson area, although now culturally bland (almost no businesses exist that are not a nationally known chain) , had the economic base to support such a small mall (only about 50 stores.) Right now it is in the process of being torn down to make way for yet another strip mall (I'm sorry, "Lifestyle Center" ,) which is the absolute last thing Anderson needs (a recent community poll also proved this.) The good news is that Anderson kept it from becoming a Wal-Mart Supercenter. But still, when I took the pictures, a faithful crowd of Mall walkers ranging from new mothers to the elderly still did laps around the desolate mall, and they're not looking forward to what's coming. I don't know what the mall looked like on the inside when it was built, but it has obviously been remodeled. The original anchors I believe were Lazarus (the store is still open and standing and has not been renovated yet... it's now old enough to be retro!) , and Elder Beerman, as well as another store that I'm not quite sure of. The earliest I remember of the mall was in 1992, when Elder Beerman closed and was replaced by the ritzy Parisian, and soon after, K-mart moved from their standalone store way down on Beechmont Avenue to the mall. Most likely at this time, the mall was renovated to some extent or another, and a TGI Friday's was built by the Food Court, thus making the Food Court slightly smaller. Around this time as well, Eastgate Mall got McAlpin's (now Dillard's) to move to the mall, and added an addition, making it noticeably larger than Beechmont Mall. Still, Beechmont Mall appeared set, with 3 stable anchors on all sides, and a decent selection of smaller stores. But what it really needed was a movie theater. There are no movie theaters in the Anderson area, and with 3 high schools in a 2 mile radius, and a large population with young children, a movie theater was desperately needed. Also, the mall really wasn't large enough to have the small stores it had. It needed stores that took up more space and complimented eachother, and the needs of the community. The layout of the mall also emphasized this fact. The Food Court is what began to die first. Even by 1996, I believe there was only the Original Cookie Company, The Great Steak & Potato Company, and Gold Star Chili. Still, the mall wasn't dead by any standards, but empty storefronts were appearing. Right then, a agressive effort should have started to attract new kinds of stores, and to some extent, this was done, but not enough. Things remained relatively stable up until the mall started changing hands. The mall, although still rather bright and airy inside, really needed some sort of renovation in the inside to set it apart, and not helping were the now red rusted arches by all of the entrances. Still, there were a quite a few attempts at getting more shoppers in the mall, such as Dinomation, where they brought in robotic dinosaurs each summer to try and show how they "recreate" the experience. It worked to some extent. Apparently, they tried for a movie theater, but none were interested, or so they claim. The truth of the matter is that the owners were just plain indecisive. Over and over again, new plans were made and old plans were scrapped to demolish the mall, and to turn it into some kind of "Lifestyle Center." Through all of this indecisiveness, they decided to euthanize the mall, giving the boot to probably some 20 stores that were left (although some refused to leave.) To my knowledge, Goldman Sachs is the entity responsible for the actual killing of this mall, as they bought it bundled with 9 other malls, and really didn't care. The only stores left in the mall are the TGI Friday's, the K-Mart, the CVS Pharmacy, a Barber Shop, UNO's, Lenscrafters, and a Nail Salon. Perhaps the most amusing part of this were the "all talk no action" plans that were taken. You would constantly see signs saying "In 30 days we will be moving to a temporary structure outside to make ways for the new Anderson Towne Center!" , that would soon be crossed out and switched to "90 days," then "Fall 2001!" These pictures were taken in January of 2003. 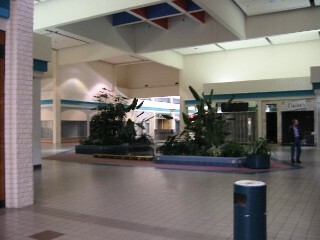 Although the mall had not been maintained since about 2001, it was still relatively a sound structure. Of course, it's gone now. What could have saved this mall would be the presence of some larger stores. A Barnes & Noble would have been great, as well as a sporting goods store (Dicks) , and a Steve & Barry's a Circuit City, etc. and this mall could easily still exist today. Unfortunately, the flavor of the month seems to be in the minds of the developers, and, well, that's what's existing today. The Mall has now been demolished, although the main entrance still stands as a way to access the barber shop. I also heard a rumor that there were plans at one time to make the mall into two story, although I have no idea how true those plans were. 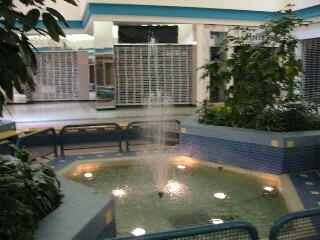 The main atrium of the mall, looking in from the main entrance corridor. To the Left was Lazarus corridor, to the Right was Parisian corridor, and straight ahead-ish was the Kmart/Food Court corridor. Still a nice place to be. The Parisian Wing with Parisian boarded up at the end. Note, this is taken from about where the main atrium was, to give you a sense of how divided up the mall layout was. There once was a Suncoast, a Victoria's Scret (seen on your Left) , a Shoe Sensation, a Paperphanalia, and a Dollar Store, around the time the mall closed. They kept the fountain running! Looking down to where K-Mart is. This is the longest corridor in the mall, and probably the most successful. 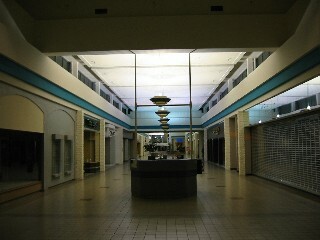 At the time the mall killed off the stores, there was a Bankhardt's gifts, Osterman Jewelers, "Things Engraved", B.Dalton Booksellers (had they only been larger....) , Regis Hairstylists, Lenscrafters, Eye World, some computer training center, and 2 Nail Salons.